Egypt has had a large share of the ingredients that made it a civilized country and a tourism longs to which the people of the world because of its beautiful views and historic areas of nature and what is highlighted in the ancient Egyptian civilization and the cultures they include architectural and decorative elements are still impressed and delighted the beholder. 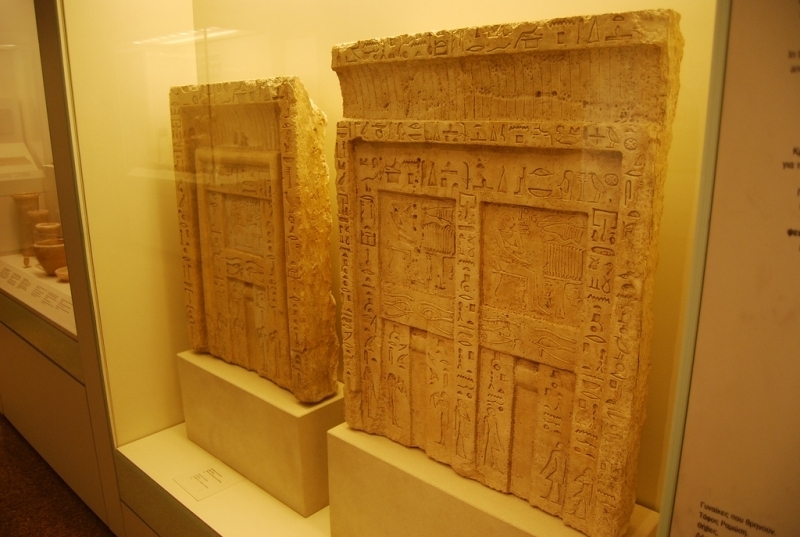 It is these elements, for example, false door enters the false door in the ancient Egyptian civilization within the framework of religious and funerary. And if it was some scientists see a false door that the name does not reflect the exact meaning of it, and if it was in most cases, it held wide-body interfaces centered interventions close in the rear cylinder and topped with stone and so can be called by the name of the entrances to the Spirit where is the human spirit and is something to separate him frequented man after his death is in the flesh and accept offerings,it is called in the ancient Egyptian language " r-pr". 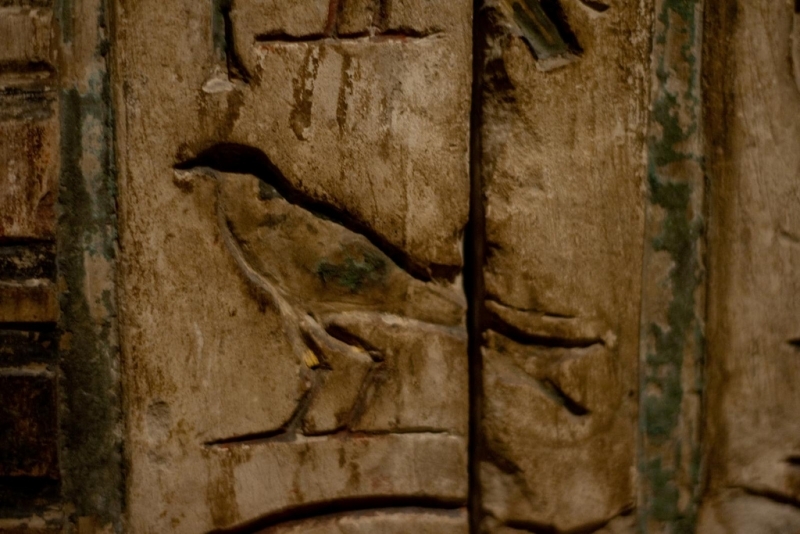 The false door is an image in stone or wood to the door of real was the mode of communication between the upper part of the cemetery where he was presenting offerings and performed funeral rites and the burial chamber where the body of the deceased. It was believed to be dead out of it to receive what is offered to him from the offerings in front of him and then return enters it To the cemetery as it is a door to the spirit guides to the path can visit the owner's body for him. To the place where you can enjoy it, including offers of their sacrifice in front of him, may prove in the front terrace or in the west wall of the compartment Eucharist and strike through groove narrow, is the door opening. It is free in most cases of any pattern or is it the owner and louder in order to winding a mat folded Engraved by the titles of the deceased and his name is above the panel between the thresholds by food Mokhtlvpoukd preceded in many cases. Lintel upper spell oblation surrounding the door slots or four or six slots by spells and titles of the deceased, his image and standing heading sometimes out of the door which means out of his grave and again and his face to the inside the door, which means entry to his grave and had engraved on the aperture also pictures of some Family members and campaign offerings coming towards deceased to visit and make oblation to him and more false doors of limestone that of what is installed in the granite above a slab of limestone landscape upon which the dining table and what is bringing them together sheets of wood together and leather belts. Some believe that the false door appeared since early historical times, where the family first appeared in the rectangles varying amplitude and depth in some parts of the walls, a bottom was found on the burial chamber as storage tools for food and drink. 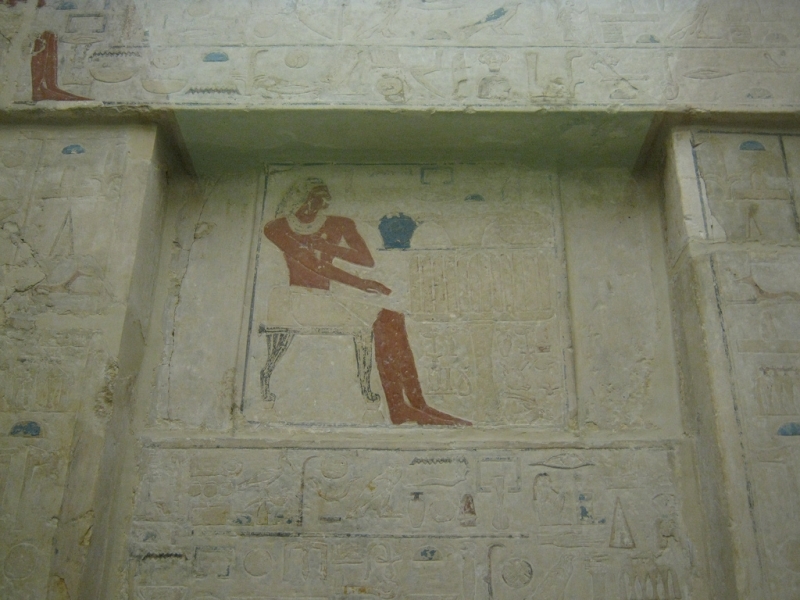 Although it was difficult to know the purpose of such rectangles and assume that the rectangles carved in the shoulders, which separates the mammary room may symbolize the entrances to behave as a symbolic of spirit. Internal aspects: the deceased was standing in front of him and Positions held in his life, and scenes of daily life. In the Fifth Dynasty we find the doors of the shoulders had continued then emerged from the side Alzachrvipvy the middle of the Fifth Dynasty surrounded Bakirzanp and culminate in the cornice was sweetened door decorations consist of rectangles and squares or wavy lines and From the middle of the Fifth Dynasty the decorations often included tours moulding (convex moulding resembling a semicircle in cross section) and a "cavetto cornice" (a concave bracket around the top of a wall or gate with a cross-section that resembles a quarter circle in cross section). It is thought that these decorations represented the plants originally used to build predynastic buildings. Images of the deceased were also fairly common. Usually, the decoration was undertaken in such a manner that the deceased appeared to emerge from the false door itself. In the Sixth Dynasty dominated the false doors of three difference in height and was decorated Corniche Or Kirzanp and the representation of eye Alaudjat. During the New Kingdom false doors in temples were often associated with a chapel known as "the hearing ear" which was generally located in the outer wall near the back of the temple close to the sanctuary. These chapels allowed those outside the temple to communicate directly with the god who could hear them through the false door. However, the majority of false doors are to be found in tombs and mortuary temples to allow the deceased to access the living world and receive offerings. In fact, the false door can be seen as the combination of an offering niche and a stele with the offering formula inscribed on it. Along with the name and titles of the deceased, and the offering formula, the decoration on the false door often included a curse to those who would harm the deceased and a blessing to those who made offerings. For example, the false door in the tomb of Redi-ness at Giza (G 5032) has the following text inscribed on it; In the Sixth Dynasty dominated the false doors of three difference in height and was decorated Corniche Or Kirzanp and the representation of eye Alaudjat. During the New Kingdom, false doors in temples were often associated with a chapel known as "the hearing ear" which was generally located in the outer wall near the back of the temple close to the sanctuary. These chapels allowed those outside the temple to communicate directly with the god who could hear them through the false door. However, the majority of false doors are to be found in tombs and mortuary temples to allow the deceased to access the living world and receive offerings. In fact, the false door can be seen as the combination of an offering niche and a stele with the offering formula inscribed on it. 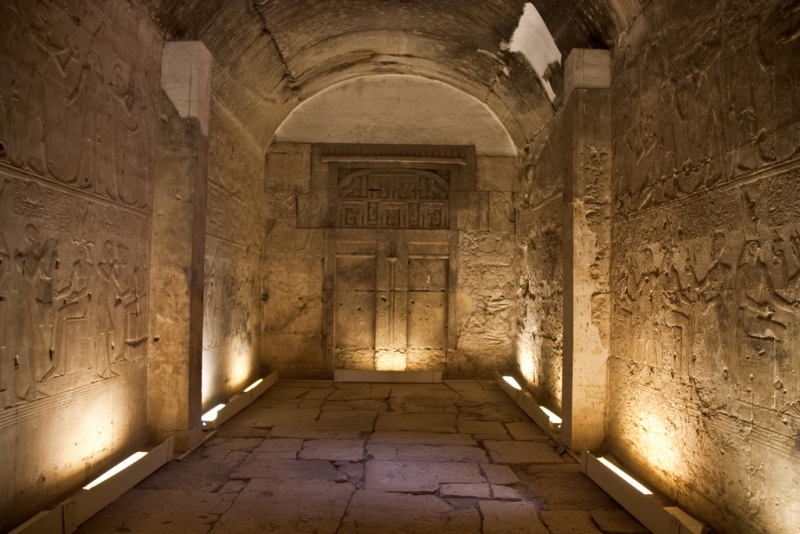 Book one of our Egypt Tours to know more about the False Doors in Egyptian Tombs.